But it was this week’s installment, “Commissions and Fees” that surpassed all showings that came before it. Lane Pryce’s demise served up that perfect Mad Men mix of anger, frustration, pity, humor and tears that we’ve grown to love. 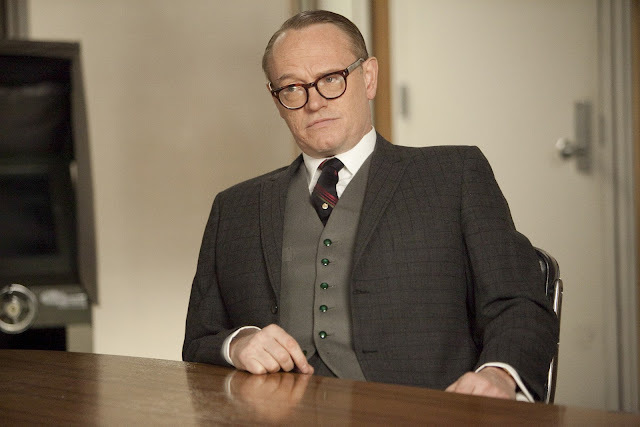 The day after the episode aired we got to speak with Jared Harris, the actor who brilliantly portrayed Lane. He talked not only about how he found out he’d be leaving the show, but the path to his character’s downfall. Jared had so many great insights and stories, we broke the article into two parts. Click here to read Part II. “[Matt] told me after the read-through for Episode 10. After the read-throughs every episode he asks everyone to hang around so that he can speak to you and give you notes because he's going to be working while shooting. He doesn't always get down to the set. “I could see he was leaving me for the last person. And then he said, ‘Let's go up to my office,’ which I knew wasn't a good sign. And then he offered me incredibly expensive brandy and then I was like I knew this wasn't going to go well. “But he explained why he wanted to do it. And he's really been building up to it for the season. And I could see, from an acting point of view, it was to my benefit to go out with a bang rather than a whimper. “At the same time I know that Mad Men is just getting bigger and bigger as it builds towards Season 7. There's already an obsession with the episode of Season 7. And I'm sad that I won't be a part of that of that build of the show. “I couldn't tell my agent. I couldn't tell my manager. I didn't take part in the pilot season this year because I knew that, if I signed on to a new show, people would know something had happened. And it was to my interest to keep it as big a surprise as possible. “I've related being a fairly thorough man. And that was in the idea that he goes off and he gets all the supplies that he needs from the hardware. And he's certainly thought about it fairly thoroughly from that point. “But has he thought about it before? I don't think ever really practically. Maybe in moments of depression we all as human beings sit there and think about, when things are really, really s#*t you think about maybe it'll be easier just to not feel this anymore. That's part of the reason why people get so s#*t-faced drunk, is to numb their feelings. “Do I think that it happened too quick? No. Would I like to still be working on the show? Of course, I love being there. What a great place to work and fantastic people to work with. But I appreciate that they used it as part of the momentum to build towards the end of the season. So I don't feel like it happened too quick from a dramatic point of view. “"Well yes but, I mean, do you know?" And I go, ‘Do I know what?’ And he goes, ‘Maybe I shouldn't have said anything.’"
“I mess with him a bit. But eventually people would find out earlier than we start shooting and they put their arm around you and say, ‘Going to miss you,’ and stuff like that." Watch the Mad Men season finale on Sunday, June 10 at 10 p.m. EST/9 p.m. Central on AMC.